Homeowners or business owners in the market for a roof replacement have an array of roofing options to choose from. Selecting the right roofing material is important because your roof takes the brunt of the weather's ferocity while doing its job of protecting your building from the elements. You want a roof that's attractive, durable and offers great lifecycle economy. For these reasons, you should consider tile roofing. Residential and commercial roofing materials include copper, wood shake, asphalt composition shingles, metal and tile, to list a few, and while each has its unique benefits and drawbacks, individuals and businesses are increasingly exploring the advantages of tile roofing for their property. Apparent in historic architecture including ancient Egyptian, Roman and later European settlers, some ancient tile roofs are still standing today, well preserved through the ages! Tile Roofs are Beautiful - One of the main reasons home and business owners choose tile roofing is for its timeless beauty. 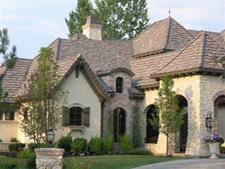 Now more than ever before, tile roofing can be customized to look exactly as you want. Available in a wide variety of materials, styles, and texturing options, and with over 700 custom colors to choose from, you're sure to find the perfect roof tiles to complement your building and appeal to your personal taste. Tile Roofs are Durable - Tile roofing is one of the most durable roofing options, with premium roof tiles featuring a class A fire rating, a class 4 hail rating, and the ability to resist winds of up to 120 miles per hour. Modern tile roofs are generally backed by a 75-year guarantee, and often last well over a century! Tile Roofing is Cost Effective - Though the vast majority of homeowners choose asphalt roofing for its low initial cost, tile roofing actually has a much lower lifecycle cost than cheaper roofing options. An asphalt roof might initially cost half as much as tile, but its life expectancy is only one-fourth that of tile (15-20 years). So the yearly cost of tile is half that of asphalt roofing, not to mention tile roofs are natural insulators, providing enhanced energy efficiency to reduce energy costs. Tile Roofing is Environmentally Friendly - Due to the longevity, durability and energy efficiency of tile roofs, they're quite environmentally friendly. They don't need to be replaced as often, limiting waste, and they conserve energy by reducing heating and cooling required to maintain comfortable interior temperatures. For tile roof installation or wholesale roof tiles from trusted tile roofing professionals in Utah or southern Idaho, ProTech Roofing can be reached at (801) 691-7720. Call to schedule a FREE roofing inspection and FREE quote for new roof tile installation or premium wholesale roof tiles, and remember to check for money-saving special offers.